Marmaris, one of the most important holiday villages in Turkey and it is the second most populated city of Mugla after Bodrum. Located in the region where the Aegean Sea ends and the Mediterranean begins, Marmaris lies to the west of the Datca, to the north of Ula. It is 1 hour away from Dalaman airport which is 1 hour away from the center of Mugla. The distance to Marmaris from Rhodes Island is only 45 minutes, approximately 2 hours away from Bodrum. In Marmaris, where the Mediterranean climate is dominant, summers are quite hot and arid. In the winter months due to Turkey’s position one of the most abundant rainfall areas in Turkey. This situation causes the annual moisture content of the district to be high. High humidity makes it possible to grow many tropical fruits in Marmaris. Marmaris, a town of Mugla, is the second most populated district of Muğla after Bodrum. Datca is the west of Marmaris, Ula in the north, Balan Mountain is the east, Marmaris where the Aegean Sea and the Mediterranean meet. With these limits, Marmaris is the longest natural harbor in the world. It is 1 hour away from Marmaris Dalaman Airport which is 1 hour away from the center of Muğla. The distance to Marmaris from Rhodes Island is only 45 minutes, approximately 2 hours away from Bodrum. Marmaris The distance to Istanbul is 813 km, 89 km from Dalyan, 643 km to Ankara and 807 km to Urgup. Marmaris is a region with a Mediterranean climate in general. For this reason, although the region is especially preferred for summer vacation in summer, Marmaris is a holiday destination that can be preferred in many months of the year because of the high temperature in the spring and autumn months. Because of the high seawater temperature in Marmaris, the region can be swim in 7-8 months of the year. The region is dominated by a warm and temperate climate. In Marmaris, summers are warm and dry, winters are warm and rainy. The region is sunshine for a large part of the year. As in all of Turkey’s Aegean and Mediterranean coastline in Marmaris it is manifested in the majority of the solar year. There is more precipitation in Marmaris in winter months. The annual average temperature of Marmaris is 18.8 degrees. The average temperature of 27.9 degrees is the hottest month of the year in Marmaris in July . January is the coldest month of the year and the average temperature in Marmaris is 10.8 degrees in this period. In Marmaris, we can list the lowest and highest air temperatures according to the month as follows: January 6-16, February 7-16, March 8-18, April 12-22, May 16-26, June 21-34, July 26-37 , August 24-37, September 18-33, October 15-27, November 12-20, December 8-18. The temperature of seawater according to the month in Marmaris is as follows: January 15, February 15, March 16, April 17, May 20, June 24, July 25, August 26, September 24, October 21, November 18, December 17 degrees. There are many alternatives to come to Marmaris. Those who want to come to Marmaris from Dalaman Airport, which is 88 km away, can reach the center of Marmaris directly by using shuttles bus that departs from Dalaman Airport. It takes about 90 minutes to Marmaris. Renting a car from the airport and reaching the center can be another option. In the same way, bus companies from many different cities provide transportation to Marmaris all year round. There are many places to be seen in the center of the Marmaris which is one of the important tourism centers of Turkey. Its surroundings have hosted man different civilizations since ancient times. For this reason, there are many historical sites that can be seen in the region. Marmaris is one of the places to see in turkey with holiday facilities, historical and magnificent natural surroundings. 3-4 days in Marmaris will be enough to enjoy the region. However, it is also possible to extend this period as much as you wish in order to get lost in the unique beauty of the surrounding villages. Marmaris is one of the most preferred regions for entering the sea in summer holidays with its legendary villagers, turquoise water and golden beaches. Marmaris has numerous coves and beaches that you can choose to swim in. You can enjoy the sea while staying in nature, which usually does not have an entrance fee. Come and see the famous beaches and clean beaches of Marmaris. Icmeler Beach: Icmeler is a popular holiday resort which is located 8 km from the center of Marmaris and hosts thousands of tourists every year. Due to its proximity to Marmaris center, accommodation alternatives, and long beaches, Marmaris is one of the first places to come to mind. There are frequent minibus services to Icmeler from Marmaris center. For this reason, transportation is very easy. Turunc Beach: Turunc is a 21 km distance to Marmaris. With its magnificent nature, restaurants, and restaurants, Turunc is one of the most preferred destinations in Marmaris. The interest in Turunc Bay is also due to the fact that it has blue flag sea. For this reason, the yachts emerging on the blue voyage are among the iron rolls. Another feature that makes Turunc unique, its submarine richness. The water is gold colored and clear, rocky areas and underwater caverns enrich the region for diving tourism. Uzunyalı Beach: It has a coastline of about 10 km extending to the Uzunyalı Beach Icmeler, which started immediately after Marmaris Public Beach. There are numerous restaurants and cafes along the coastline along the beach. Cleopatra Island(Sedir Island) Beach: Sedir Island, also known as Cleopatra Beach, is 16 kilometers north of Marmaris and one of the must-see beacheso of Marmaris. The sandy beach of the island and the crystal clear sea are very famous. Orhaniye / Kizkumu Beach: Orhaniye is surrounded by pine forests. What makes it famous is the world famous Kizkumu Beach and the sea. The shallow canal, which you can walk in the sea, can make it especially nice for photographers to catch beautiful squares. 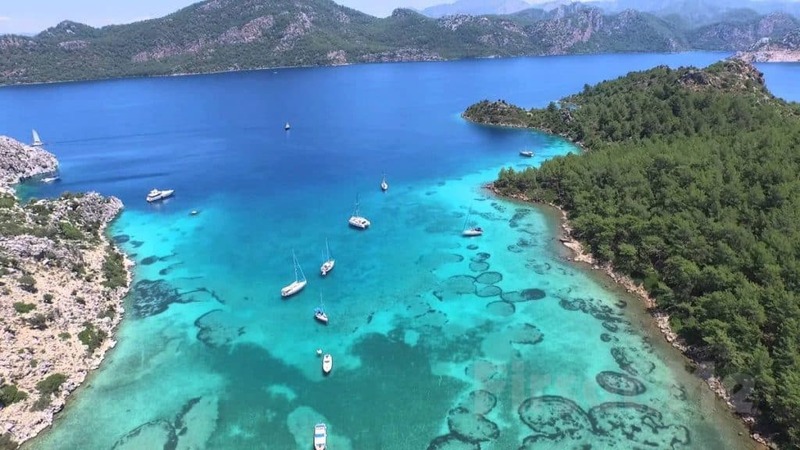 Bordubet Bay: Bordubet Bay, situated on the Resadiye-Marmaris, was named after the British troops hiding in this bay many years ago gave the region the name “Bird the bed”. Bordubet, where the sea merged with the forest and was far from being constructed; plant, a virgin area with animal diversity. 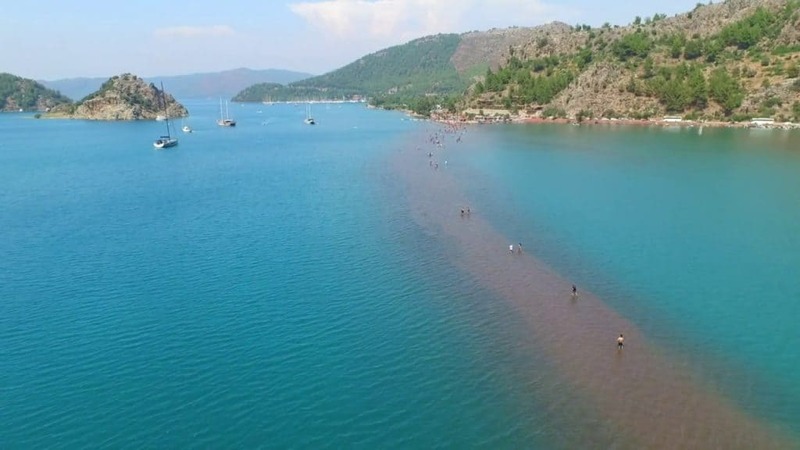 One of the most important features of Bordubet is that the sea forms a channel 200 meters wide and 600 meters long while moving towards the forest. Kumlubuk Bay: Kumlubuk, is a 6 km distance to Turunc. Kumlubuk Bay is located in the distance can be reached from the boat from Marmaris. The unique beauty of this bay is waiting for its guests with its natural crystal clear sea. Boncuk Bay: Boncuk Bay, located near Sedir Island, is especially impressive with its clear and clean sea. Boncuk Bay also has facilities for sightseeing. Where do you stay in Marmaris? Apart from these hotels, there are also a number of cheap hotels, villas and pensions in Marmaris. It is possible to find accommodation for every budget. Places that can be preferred for accommodation in Marmaris are usually located on the coastline. Marmaris center, Uzunyalı, Siteler, Armutalan, and Icmeler are many accommodation alternatives in the region. If you do not want to stay away from the lively nightlife of Marmaris, staying in the center can be the right choice for you. So you can easily reach the places you want to see. Marmaris is one of Turkey’s most important holiday regions so the transportation in Marmaris is very comfortable. Mini buses, buses, taxis and rental cars are the most used alternatives to reach the nearby bays. Between Armutalan, Beldibi, and Icmeler, there are permanent minibusses. If you want to go, some of the nearby districts and borders of Marmaris are as follows: Ula: 41 km, Datça: 75 km, Köyceğiz: 57 km, Icmeler: 10 km, Gökova: 32 km, Kumlubük: 24 km, Turunç: 21 km, Orhaniye: 30 km, Selimiye: 70 km, Bozburun: 75 km, Karacasogut: 35 km, Camlı: 25 km. You can use buses, departing from the bus station are used for transportation to other cities. There are many places to explore Marmaris and its surroundings on foot or by bicycle. Most of these regions are also suitable for nature lovers who want to climb mountain climbing and rock climbing. In particular, the canyons of Icmeler, Beldibi, and Yerkesik-Sarnic villages are alternative for both canyon tours and those who want to climb rock climbing. In Armutalan and Ciftlik Bay, rocky areas suitable for rock climbing are also located. Bicycle buffs also prefer Marmaris – Icmeler beach, Gunnucek, Yalancı Bogaz and Paradise Island in Marmaris in order to make their vacation more active. Apart from these, Gokova shores between Karacasogut and Bordubet, Hisaronu, Orhaniye, Selimiye and Bozburun coastal strips, Bayır and Söğüt village roads are also suitable for cycling. Another means you can use for transportation in Marmaris is ferryboats and boats. Ferries are especially preferred to go to Rhodes Island from Marmaris. The distance between Marmaris and Rhodes is 25 nautical miles and it takes about 1 hour . The flights from Marmaris are done at 09.15 in the morning and return flights from Rhodes are done at 17.00 . The boats in the municipality’s dock located in the center of Marmaris are preferred for nearby day-trips. During your visit in Marmaris, you will have the opportunity to taste the delicious food of Aegean and Mediterranean cuisine. In Marmaris, there are restaurants displaying successful examples of Turkish and international cuisines (Chinese, Italian, British and Indian restaurants), especially seafood. In the center of Marmaris, you can choose restaurants around the yacht harbor for fish and seafood. In Icmeler, Turunc, Akyaka, Ciftlik, Orhaniye, Selimiye, Bozburun and Sogut, you can taste the most outstanding examples of the Mediterranean and Turkish cuisine. Also in the districts near Armutalan and Icmeler, village kitchen, waffle and pasty are frequently preferred. Camlık, Bayir, Ciftlik, Turgut, Orhaniye on the road and coastal restaurants with local tastes are very successful. Seafood and olive oil are concentrated in Marmaris cuisine. The dishes are almost exclusively made with olive oil because the Aegean region is common in olive cultivation. In addition, vegetable growing in Marmaris has also developed. For this reason, green salads are served every other day. Some of the delicacies that Marmaris has to taste for its local cuisine are: the surprise made from the kid’s arm bones in the days when important events such as marriage weddings, circumcisions. Marmaris is one of the most touristic regions in the Aegean Region, which ensures that this region is active day and night in the summer. At the same time, yachts and boats on the blue voyage also frequently come to Marmaris, which means the increase of modern enterprises and the coloring of nightlife. Marmaris has many bars, disco, and nightclubs, especially around Netsel Marina. Listening to music and dancing in Marmaris, you can move your holiday nights. In particular, the bars are situated parallel to the Marina and there are businesses according to every taste. In the same way, there are bars in Marmaris Içmeler and Armutalan region. Apart from the bars in the concepts that appeal to every taste from hip-hop music to different dance shows, Turkish nights are organized especially for foreign tourists. There is a wide range of shopping opportunities in Marmaris as it is in other tourist areas. There are many stores in the region, especially on carpets, leather, jewelry and clothing. In addition, Marmaris does not leave the walkie-talkie without taking the famous pine flower from the region. You will be able to choose the regional markets for honey and jam. Every week Wednesday, Icmeler market , thursday Marmaris market, and Tuesday Armutalan bazaar. One of the preferred addresses for shopping in Marmaris is the Grand Covered Bazaar, also known as Old Bedesten. Every bazaari in the center of Marmaris, crowded and very active. There are many alternatives such as carpets, rugs, jewelry, souvenirs, branded clothing, eating and drinking, and at the same time, Marmaris Post Office is also in the market.